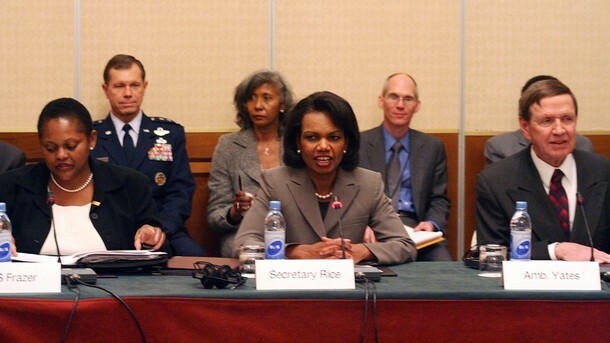 Condoleeza Rice and Jendayi Frazer(left) . Frazer taught at D.U. for a short time. She became Rice's Undersecretary of State for Africa and was, for a while the US Ambassador to South Africa. and National SecurityAgency head during the Bush years, and one of the key high level people in the Bush Administration to authorize the use of torture of prisoners of war in `the war on terrorism’, has a strong connection with Denver. She lived here for many years; her father was a dean at the University of Denver from where she got both her bachelor’s degree and PhD. I hardly knew her. A friend, now chair of the Political Science Department at Metro State College, relates that Rice accompanied him to a talk I gave in defense of a film Vanessa Redgrave made on the Palestinians some thirty years ago. Another friend dated her. He found her uptight and rather boring. Given all this, it should not be surprising that `Rice’s legacy’ would be the subject of great interest here in Colorado both for national and local reasons. A bout a year ago – I don’t remember the exact date – Alan Gilbert debated a conservative Republican state senator on the question `Should Condoleeza Rice Be Indicted For War Crimes’. It was organized by D.U. students, the administration was nervous about it but the event went ahead anyway. It was well attended and the debate well organized. I do remember Rice’s Republican defender arguing `Why single out Rice? Shouldn’t others be targeted as well?’ The rest of his arguments were not particularly convincing but I did agree with that point. More recently, a film about Rice played for two weeks in a local Denver theater. American Faust documents Rice’s political evolution. As the title suggests, it is not a pleasing portrait of the former Secretary of State, suggesting hers is a career of rank opportunism, fawning to the Bushes, father and son, and in the end, not being a particularly good Secretary of State or head of the National Security Agency. After one of the Denver showings, two of the films `stars’ took question from a packed house of maybe 100 people. Doug Vaughan, investigative journalist and oscar winning film co-producer (The Panama Connection) was a fellow graduate student with Rice. Alan Gilbert, as mentioned above, was one of her profs. The two of them field questions and give commentary about the film and Rice’s role. Hmm that’s interessting but to be honest i have a hard time determining it… wonder how others think about this..
Keep up keeping up! Luv: Nelson and Pipa. Concerning getting responses – it comes slowly. Takes time and we are all impatient for feedback aren’t we. it will come.